NitroShare is a cross-platform tool for sharing files across a local network. After completing the setup wizard, NitroShare discovers other machines on the network running the tool and enables you to send files to them using the application indicator or small widgets on the desktop. NitroShare runs on Windows, OS X, and Linux. Files can easily be transferred between machines running different operating systems. This will install nitroshare on ubuntu 16.04.Now you need to install nitroshare on windows10. 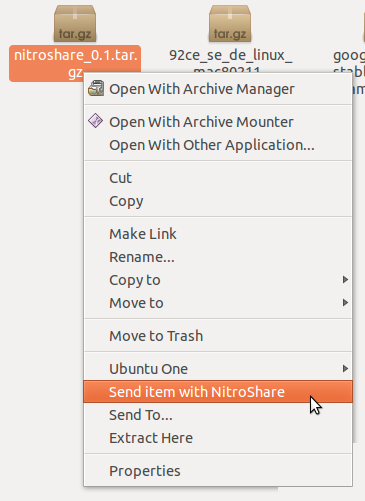 After installation you can share any document or directory by right clicking on it you should see option of send item with nitroshare.